Each session we eat, talk, play and most importantly we compare current events to Bible prophecy. is working His plan for all of humanity. We find our place in this world, discover our meaning and are encouraged to live deeper in the Word of God. Col 2:6-7 And now, just as you accepted Christ Jesus as your Lord, you must continue to follow him. strong in the truth you were taught, and you will overflow with thankfulness. 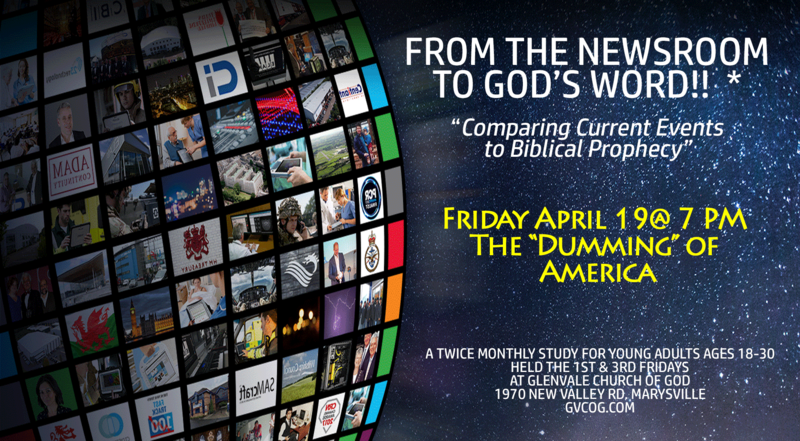 We at the Young Adults ministry of Glenvale Church of God have begun a series of Friday night discussions where we look at the events that are unfolding on the evening news, online and in social media today and compare these events with biblical prophecies made thousands of years ago. We will take a hard look at major issues that affect all of us and look to answer the following questions. What is really going on? Should we be worried? Are we being deceived? What can we do? 3/1519 RFID Chips Implanted...a Sign of Christ Return? 3/29/19 Privacy and Technology: Is Big Brother Watching You? 4/5/19 The Political Agenda: why so much hate? 4/19/19 The Dumbing of America: What do we really know? 5/3/19 Technology Addiction: Is this really a thing? Plus food, fellowship, games and a safe environment to hang out in.